These keto thumbprint cookies have all the flavor and texture of your favorite classic thumbprint cookies! Low carb and gluten free. Combine the egg, butter, almond flour, salt, baking powder, erythritol and vanilla in a medium bowl. Mix well with a fork until a dough is formed. Place the chopped walnuts on a plate. Form the dough into 1.5 inch balls and roll in the walnuts to coat. Remove from oven and press a small dent into the center of each cookie. 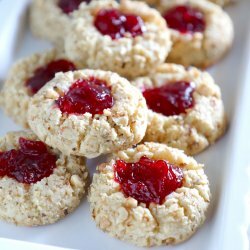 Place approximately 1 teaspoon of jam in each cookie dent. Remove and transfer to a rack or platter to cool for 30 minutes. Cookies MUST be fully cool to stay together – until then they will be quite fragile, so handle gently when transferring.